Skype has been in the news lately for acquisition by Microsoft at astronomical price. Some has said Microsoft will ruin Skype, and the proof seems coming too soon. Skype is now currently down for a major outage for quite a number of Skype users, especially users who are about to log into the Skype. To make matter worse, upon launching and attempting to sign into Skype client, the application automatically shut itself down, with error message “Skype has stopped working,” caused by unknown problem. The issue seemed to affect Skype users worldwide randomly regardless of platform. Windows, Mac OS X and Linux Skype clients all seem unable to login to Skype network. In Windows, the Skype program will stop responding, and auto close itself, giving an impression that you may need to reinstall Skype. If you still stayed logged into Skype, apparently you not spare from the issue too. It’s reported Skype users have intermittent issue when making voice or video calls. In addition, the status of contacts apparently are not updated too. It means that people who are affected and unable to sign in or those who just logout still appears as online. Despite the Microsoft Windows error message is saying that Windows will notify you if a solution is available, but don’t hope much. 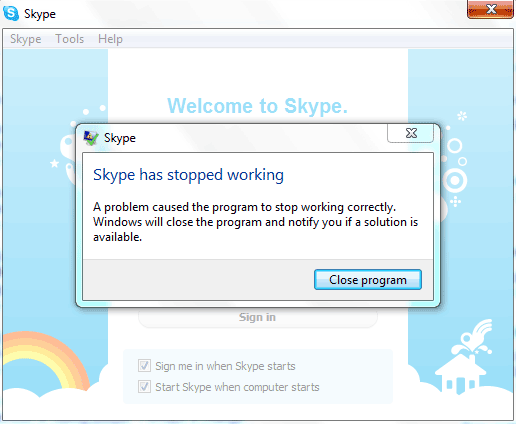 It’s probably better to follow @Skype for notification when the telephony service is up again. It’s almost an hour since incidents started to be reported, yet no cause and solution is found yet. For thousands of people worldwide affected by Skype outage, the only thing can do for now is wait, and pray that union with Microsoft does not mean bad luck for Skype. Update 2: Skype users who face login issue can now fix the problem by upgrading to latest version of Skype (from version 5.3.0.111 to version 5.3.0.116), and it’s considered to be an “easy fix” for Skype users who do nothing to deserve this by Skype. Mac OS X update has also been released, while Linux users have to follow steps below to get the problem resolved. Update 1: Skype has posted a new tweet stating that “thanks for your patience – we’ve identified the problem and will be rolling out a fix soon.” If you can’t wait, there is report that the Skype will work if you delete the following file \Users\%UserName%\AppData\Roaming\Skype\shared.xml (in Windows 7 or Vista), \Documents and Settings\%UserName%\Application Data (in Windows XP) or ~/Library/Application Support/Skype/shared.xml (in Mac OS X). Ensure that “Show hidden files and folders” is switched on. Restart Skype. The shared.xml file will be recreated. Click Start and then Run…. Delete the file shared.xml (it will be recreated once you open Skype again, this is fine). Anyway, lucky Skype users who are still able to login to Skype network, just DO NOT sign out or restart your computer, if you don’t want to have your Skype app crashes, for now.